This condition is marked by patches of skin that are darker in color that the surrounding skin. The darkening happens due to an excess production of melanin. Melanin is a brown pigment that creates normal skin color. This condition can affect anyone of any skin color. According to the American Osteopathic College of Dermatology (AOCD), hyperpigmentation is a harmless condition. Freckles, sunspots and liver spots are a very common type of hyperpigmentation. These spots appear because of UV damage and are often called solar lentigines. They often are seen on the face, hands, or areas that are often exposed to the sun. Melasma is a form of hyperpigmentation which turns areas of a person’s skin a light or medium brown color. It typically develops on a person’s face including the cheeks forehead and nose. This condition is caused by hormonal changes and often occurs to women during pregnancy pr whn taking the birth control pill. Melasma also increases when the skin is exposed to the sun. PIH is caused by inflammation or injury or some form of trauma to the skin. It can be the result of various illnesses or a hormonal disorder. PIH could be caused by various inflammatory skin conditions such as contact dermatitis, psoriasis or eczema. These conditions may contribute to hyperpigmentation resulting in red or brown-colored spots on the skin. If your skin is affected by hyperpigmentation, it will be darker than the other parts of the skin. Whether the skin has been darkened by the sun or because of hormonal changes, it will be marked by a darker patch of skin. The main symptom of hyperpigmentation is a display of skin that is darker than the adjacent skin. Common areas where hyperpigmentation occurs include the hands, arms, and face. This condition, while not serious, is not always aesthetically pleasing. Signs of hyperpigmentation include the appearance of age spots, liver spots, sunspots, freckles, melasma, and related skin abnormalities. Skin conditions such as acne, eczema or psoriasis. Any of the above skin conditions can be treated with one of various treatments, including the use of natural essential oils. Although hyperpigmentation is considered harmless, certain darkened spots, such as moles, should be checked by a dermatologist. Some of the spots may be cancerous. When the hyperpigmentation is caused by acne or a skin treatment that failed, it is referred to as PIH, which is an acronym for post-inflammatory hyperpigmentation. Any skin inflammation that leads to hyperpigmentation is referred to as PIH. Several treatments are now used to treat hyperpigmentation conditions. These therapies include intense pulsed light or a photo facial, chemical peels, and laser peels. An intense pulsed light, also called an IPL, can make the condition worse if it is not employed properly. Anyone choosing this treatment approach should go to a specialist. Chemical peels should also be administered for hyperpigmentation carefully. Pigment issues or scarring can result if a chemical peel is applied by an inexperienced clinician. Deep peels, such as phenol peels, should be closely followed up. Laser peels for hyperpigmentation problems use a laser to resurface the skin. Both fractional lasers and CO2 lasers are used for this purpose. Some people opt for skin-lightening products, such as skin care solutions that contain skin-lightening ingredients such as retinoids, kojic acid, vitamin C, and hydroquinone. For anyone wanting a less invasive solution, essential oils can be used to clear up hyperpigmentation problems. You just need to be patient when using the oils as results are not immediate. They can reduce hyperpigmentation if used regularly. In severe cases of hyperpigmentation, a cortisone cream may be recommended. This cream may cause irritation for anyone with sensitive skin. Usually, improvement is noted after about six months. Creams with tretinoin are used for the same purpose. Fortunately, there are a number of potential natural remedies to treat hyperpigmentation and these include a number of essential oils. Also, certain extracts are suggested for the skin condition, including mulberry extract and licorice root extract. The essential oils that are used can be applied topically to the skin and are ideal substitutes for remedies such as laser resurfacing. Use essential oils to treat hyperpigmentation the same way you would a face cream. Apply about 10 drops with a carrier oil such as argan oil to obtain the best results. Massage the oil into the face or at the site where the hyperpigmentation appears. Ongoing use of the oils below will reap results in about six months. When storing an oil, add it to an amber glass dropper bottle for regular use. This oil is highly recommended because it provides bleaching properties. The oil, which is derived from lemon peels, is concentrated and contains limonene, which is a skin-bleaching ingredient. Limonene also evens out the tone of the skin by dissolving dead surface skin cells. Although lemon essential oil is very effective for hyperpigmentation, it contains furanocoumarin compounds like other citrus essential oil that have been found to increase the skin’s sensitivity to UV light. Never apply lemon essential oil at daytime or expose your skin to direct sunlight for at least 12 hours after applying it as this will actually worsen the hyperpigmentation. Only apply this essential oil at night time, diluted with a carrier oil or even mixed with your night cream. This is one of the best essential oils to use for hyperpigmentation or skin darkening. This oil is derived from carrot seed from wild carrot plants. It takes around 3,000 seeds to obtain one teaspoon of carrot seed oil. The oil is rich in beta carotene, an antioxidant that gives carrots their orange hue. Beta carotene is also useful in reducing the formation of a darker pigment by inhibiting tyrosinase, an enzyme that promotes the production of melanin. Carrot seed oil is recommended for treating dark spots and melasma. This oil is known for its facial soothing qualities. Lavender oil is good for reducing the appearance of rashes and irritation. Because it is also know to gradually reduce the looks of scars, it can be used for anyone who displays hyperpigmentation from acne scars. Sandalwood trees must mature as long as 80 years before essential oil can be extracted from the plant. The oil has been used since ancient times to relieve rashes and skin irritations. It is known to fade scar tissue and soothe itchy skin. Sandalwood oil is useful in diminishing the look of skin discolorations as well. Frankincense essential oil is usually recommended for treating scar tissue. It is also ideal for reducing the look of discolored skin. The woody-scented oil has also been burned as incense in homes since ancient times. Besides a carrier oil, you can also combine frankincense essential oil with shea butter, which it blends with perfectly. Chamomile essential oil contains anti-inflammatory properties. This oil is recommended for post-inflammatory hyperpigmentation or PIH. This oils can be blended with lavender essential oil and shea butter for optimum results. Possibly best known for its beautiful fragrance, rose essential oil is a wonderful skin friendly oil which has been used as a skin treatment for many, long years. According to legend, a Persian princess discovered the oil after seeing drops of oil collecting in a courtyard fountain filled with rose petals. It is used for a wide range of skin conditions including eczema, rosacea, psoriasis and acne and has outstanding anti-inflammatory effects. This wonderful oil can also rejuvenate and brighten discolored or dull looking skin and may be used to treat hyperpigmentation. Simply add a few drops of your rose essential oil to a carrier oil like coconut or argan oil and apply it to the affected areas several times a day. Geranium essential oil is another impressive oil which has been used for a wide range of skin conditions. It is widely used to treat acne, eczema and psoriasis as well as general skin care. Geranium essential oil may also help lighten scars, dark spots and other blemishes and may well help to treat hyperpigmentation naturally. Combine your geranium essential oil with a suitable carrier oil and apply it to the affected area of your skin several times a day. Bergamot essential oil is another excellent natural remedy for hyperpigmentation as well as various other skin conditions. It has excellent anti-inflammatory, antimicrobial and astringent properties making it a great choice for skin conditions like acne or eczema as well as skin care in general. Not only does bergamot oil help treat common skin conditions but it may also help treat discoloration of the skin and many people claim that it is an excellent remedy for hyperpigmentation. This sweet, citrus oil may help treat hyperpigmentation by controlling the distribution of the skin’s melanin. Like lemon oil and other citrus oils, bergamot is known to increase sensitivity to the sun. You should apply it at night and make sure you do not expose any areas of skin to direct sunlight for at least 12 hours after applying it. . Although this article has focused on essential oils, it would be remiss not to at least mention retinoids. Retinoids are actually among the most effective and most popular natural treatments for dark spots and sun damage. You can find retinoids in many skin care products in the form of retinol and retinoic acid. It can help reduce hyperpigmentayion and uneven skin color while it also strengthens elastin fiber and supports structural collagen. Retinoids are also used to reduce the uneven pigmentation that results from skin conditions like rosacea, dermatitis and acne. You should use a serum that contains around 1% retinol and start by applying it slowly. You can also combine your retinol serum with one of the essential oils mentioned in this article. It is important to bear in mind that people with sensitive skin may not be able to tolerate retinol well. There are any number of potential carrier oils for you to use with your essential oils. Argan oil, jojoba oil, coconut oil and sweet almond are all popular, but the choice is ultimately yours. While shea butter is not a carrier oil, it can be used in this capacity and blends well with chamomile essential oil and sandalwood oil. What Is the Best Oil to Use for Hyperpigmentation? To reduce the looks of darker skin, lemon essential oil is recommended because of its skin-bleaching properties. Carrot oil can also be used to treat hyperpigmentation and is a top oil because it contains beta carotene. Beta carotene is helpful in reducing the enzyme in the skin that encourages melanin production. If you use both of the essential oils in combination, you should see good results. What Is the Best Oil to Treat PIH? Chamomile essential oil is recommended for treating post-inflammatory hyperpigmentation because it contains anti-inflammatory properties. When blended with lavender oil, it offers a soothing treatment. What Is the Best Oil to Use to Fade Both Scars and Discoloration? If you have a problem with some scarring and discoloration, frankincense essential oil comes highly recommended. You can blend this oil with shea butter as a carrier and receive excellent skincare results over time. What Is the Best Essential Oil to Use for Acne Scarring? Use lavender oil to fade acne scarring and hyperpigmentation. You can also use the oil to get rid of skin irritations, particularly rashes. Can Essential Oils Be Stored? Essential oils can be stored for use. Just make sure that the area is cool and dry. Oils can lose their efficacy if they are stored in a location that is not temperate. Essential oils are a wonderful gift from nature but they must be treated with respect. Make sure that you buy your essential oils from a reputable supplier. Essential oils are very powerful and should never be taken internally. Before applying essential oils to your skin, you must dilute them with a suitable carrier oil. Coconut oil, argan oil and jojoba are all good examples but there are many more to choose from. Never apply essential oils to your skin undiluted. Even after diluting your oil, you should perform a patch test by applying a small amount to a discrete area of your skin. If you suffer any form of reaction, do not use the oil any further. 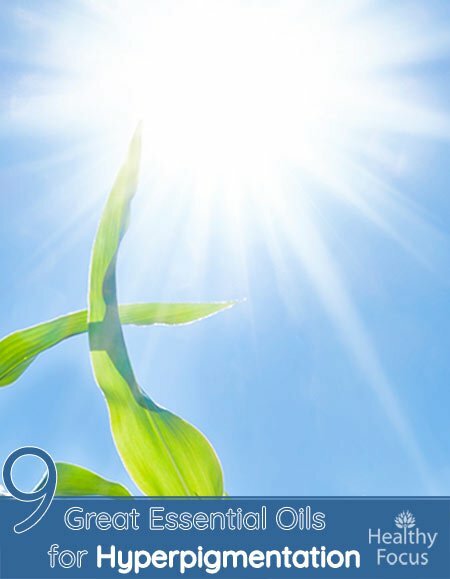 Citrus oils like lemon and bergamot are known to increase sensitivity to sunlight. After applying these oils to your skin, avoid direct exposure to the sun for at least 12 or 24 hours. If you wish to appear more beautiful, you will find that essential oils are a great natural answer. Many oils have excellent skin friendly actions like anti-inflammatory, antimicrobial, antioxidant and astringent properties that are great for a range of skin conditions. Some oils like the ones listed may also help treat hyperpigmentation of the skin but you should not expect very fast results. Essential oils are a potential natural alternative to the more traditional treatments on offer such as chemical peels that can further damage the skin especially if they are not applied by an experienced clinician. It may take longer to see results with essential oil, but you will see long-lasting results with their ongoing use. You just need to know which oils to select for your particular hyperpigmentation problem. Take a survey of the oils that are featured online. Maybe you already use an oil that has reaped good results. If so, you should share your findings here online. Whatever your selection in an oil, you will find that this natural treatment will provide you with results that will keep your skin glowing and beautiful.